In the English service a pyro metol developer was generally used, producing stained negatives. The French, American and Italian practice was to use metol-hydrochinon, without staining. A special chlor-hydrochinon developer, worked out by the Eastman Research Laboratory for the United States Air Service, has probably the greatest merit of any yet tried. 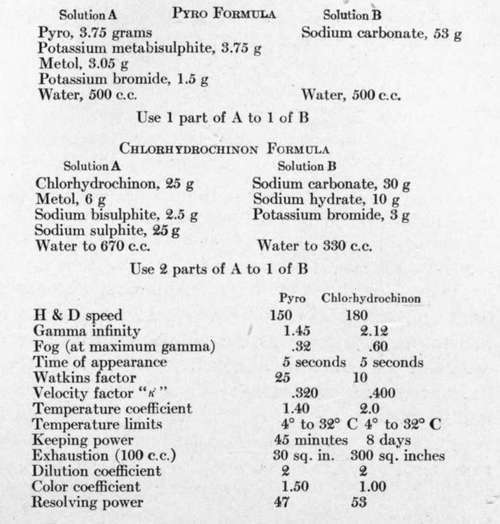 A comparison, given below, between it and a pyro metol formula used on a representative plate, illustrates the use of the various bases of study given above. To keep the ingredients in solution in cold weather, 50 c.c. of alcohol should be included in every litre of solution. All things considered this is probably the most practical and satisfactory developer for aerial negatives. Potassium bromide .5 to 1.0 "
Sodium thiosulphate (hypo) 350 grams. Potassium chrome alum 6 "
Hypo, 35 per cent. 100 volumes Acid hardener 5 "
Acid acetic 28° 400 c.c. Sodium sulphite 100 grams Water to 1 litre. These processes have been little employed in air work. Reduction is rarely necessary, for obvious reasons. Intensification would often be of value, but the common practice, which saves some time, is to use printing paper of strong contrast for those negatives which are deficient in density and contrast. When intensification is desirable or permissible, either the ordinary mercury or uranium intensifier may be used. In the field it is found necessary in many cases to purify the water that is to be used in mixing up chemicals. (a) Filter the water through a cloth into a barrel, add about one gram of alum for every four litres of water, and allow to settle over night. Draw off the clear liquid from a plug in the side as required. (b) Boil the water and allow it to cool over night. If the water contains dissolved lime, boiling will often cause this to come out of solution.